Abdullah, H., Meng, Q., Zhao, L., Wang, F., (2009) “Field study on indoor thermal environment in an atrium in tropical climates”, Building and Environment Vol. 44, pp.431– 436. Ahmed, Z. U., Ghingold, M., Dahari, Z., (2007) Malaysian Shopping Mall Behavior: An Exploratory Study, Asia Pacific Journal of Marketing and Logistics, Vol.19, No.4, pp. 331- 348. Arslan, Tülin Vural (2009) "Türkiye’deki Alışveriş Merkezleri İncelemelerine Eleştirel Bir Bakış: Yorumlar, Eleştiriler, Tartışmalar", Uludağ Üniversitesi Mühendislik-Mimarlık Fakültesi Dergisi, 14(1), pp.147-159. Bloch, P.H., Ridgway, N.M., Dawson, S.A. (1994) “The Shopping Mall As Consumer Habitat”, Journal of Retailing, Vo.70, No.1, pp. 23-42. Chen, B., Kang, J. (2004) “Acoustic comfort in shopping mall atrium spaces-A case study in Sheffield Meadowhall”, Architectural Science Review, Vol. 47. Cheng, E. W. L., Li, H., Yu, L. (2007) “A GIS Approach To Shopping Mall Location Selection”, Building and Environment, Vol.42, No.2, pp. 884-892. Chowa, W.K., Fungb, W.Y., Wong, L.T. (2002) “Preliminary studies on a new method for assessing ventilation in large spaces”, Building and Environment Vol.37, pp.45-152. Chun, C. Y., Tamura, A. (1998) “Thermal Environment and Human Responses in Underground Shopping Malls vs Department Stores in Japan”, Building and Environmenr, Vol. 33, No. 2-3, pp. 151-158. Demir, K., (2003), Noise Control and Constructual Preventions at Shopping Centers: Two Examples in Ankara. Master thesis submitted at Gazi University. Dökmeci,P.N., (2009), Acoustical Comfort Evaluation in Enclosed Public Spaces with a Central Atrium: A Case Study in Food Court of Cepa Shopping Center. Master thesis submitted at Bilkent University. El-Adly, M. I. (2007) “Shopping Malls Attractiveness: A Segmentation Approach”, International Journal of Retail & Distribution Management, Vol. 35, No.11, pp. 936-950. Fanger, P., O., (1970), Thermal comfort: Analysis and applications in environmental engineering, Danish Technical Press, 244 pages. Haghighat F, Donnini G. Impact of psycho-social factors on perception of the indoor air environment studies in 12 office buildings. Build Environ 1999;34(4):479-503. Li, W.M., Lee, S.C., Chan, L.Y., (2001) “Indoor air quality at nine shopping malls in Hong Kong” The Science of the Total Environment Vol. 273 pp. 27-40. Melikov A, Pitchurov G, Naydenov K, Langkilde G., (2005), Field study on occupant comfort and the office thermal environment in rooms with displacement ventilation. Indoor Air;15(3):205-14. Nakano J, Tanabe S, Kimura K., (2002), Differences in perception of indoor environment between Japanese and non-Japanese workers. Energy Build;34(6):615-21. Navai M, Veitch JA. (2003) Acoustic satisfaction in open-plan offices: review and recommendations. Newsham G, Brand J, Donnelly C, Veitch J, Aries M, Charles K. (2009), Linking indoor environment conditions to job satisfaction: a field study. Build Res Inf; 37 (2):129-47. Norbäck D. (1995), Subjective indoor air quality in schools- the influence of high room temperature, carpeting, fleecy wall materials and volatile organic compounds (VOC). Indoor Air;5(4):237-46. Pellerin N, Candas V. (2003), Combined effects of temperature and noise on human discomfort. Physiol Behav 78(1):99-106. Smedje G, Norbäck D, Edling C., (1997), Subjective indoor air quality in schools in relation to exposure. Indoor Air 7(2):143-50. Turley, L.. W.,Milliman, R. E. (2000) “Atmospheric Effects on Shopping Behavior: A Review of the Experimental Evidence”, Journal of Business Research, 49, (2) pp. 193-211. Vural, T., Yücel, A., (2006), “ Çağımızın yeni kamusalmekanları olan alışveriş merkezlerine eleştirel bir bakış”,İTÜ Dergisi/a: Mimarlık Planlama Tasarım, 5(2), 97-106. Working Group For Sustainable Construction, (2004) “Working Group for Sustainable Constructions Methads and Techniques Final Report, Brussels, Belgium. Yamtraipat N, Khedari J, Hirunlabh J. (2005) Thermal comfort standards for air conditioned buildings in hot and humid Thailand considering additional factors of acclimatization and education level. Solar Energy,78(4):504-17. Makale 29.05.2013 tarihinde alınmış, 07.03.2014 tarihinde düzeltilmiş, 10.03.2014 tarihinde kabul edilmiştir. ISNAD SEZER, Filiz ŞENKAL , ARSLAN, Tülin VURAL , ÇAHANTİMUR, Arzu . "Alışveriş Merkezlerinde Kullanıcı Memnuniyetinin Konfor Koşulları Açısından Değerlendirilmesi: Bursa Örneği". 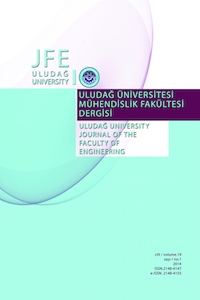 Uludağ University Journal of The Faculty of Engineering 19 / 1 (April 2014): 81-95.